I love this dish. Its a staple of Punjabis and in Delhi its even served for breakfast. The surprising thing is that whenever I have eaten in Delhi, I’ve had it for breakfast, followed that with a glass of sweet lassi. Trust me – the glasses there are quite large (often I’ve not been able to finish off the lassi). 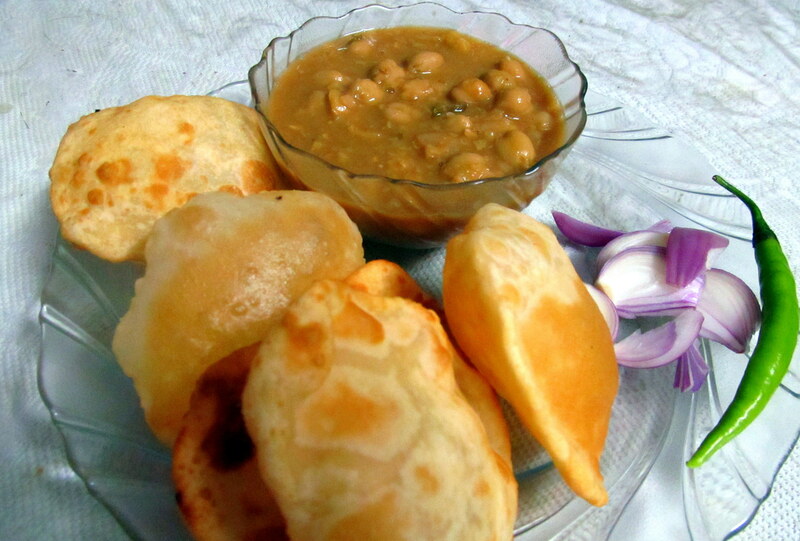 The chana is served with bhatura / kulcha or puri. I love the kulchas and bhatura there. After such a meal, I always have said NO LUNCH. But come lunch time and I am ready to eat! Can’t do the same in Mumbai – dunno why. Below is the snap I took of my chana-bhatura. Made it for dinner. Served and eaten Punjabi style – with sliced onions and green chili – yummmmm………. This entry was posted in ghar ka khana, Punjabi food and tagged bhatura, chana, chana bhatura, channa bhatura, chole, punjabi food. Bookmark the permalink.